Hi and welcome to our sixth Pick ‘n’ Mix Fridays. A new blog link up with me and the lovely Stevie over at A Cornish Mum. We welcome you to link your posts on any topic, the more variety the better. My favourite post from last week is Boys Don’t Cry by Fazed and Confused. As a Mum to two boys I understand everything she says. 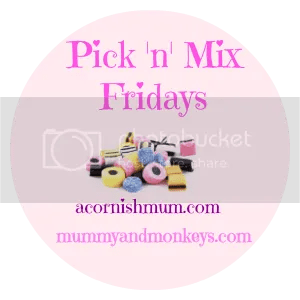 "Pick ‘N’ Mix Fridays 14/8/2015"
"Allergy Friendly baby meal ideas"
Fab linky as always, just linked up! Thanks for hosting! It’s my first time linking up to #PicknMix 🙂 Looking forward to reading the posts!